When I was a kid, I went on a family vacation to the Outer Banks in North Carolina every year. I loved to see the iconic lighthouses there, and each year I brought home a souvenir model of a different one (I completed the collection years ago). 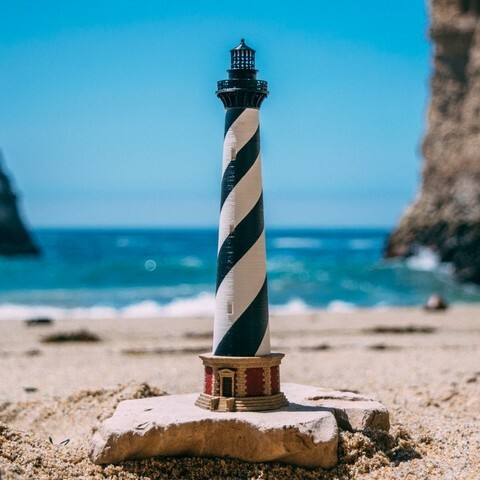 I thought that Cape Hatteras--the most famous of the NC lighthouses, and my favorite one--would be the perfect structure to model for the SeeTheWorld challenge. Over the past month, I developed a multi-piece 3D model of the lighthouse from scratch, designed to be completely 3D printer friendly. The kit consists of 11 STL files, one of which you print 16 copies of. The largest single piece has a height of 182mm (~7.2in), and the assembled model stands 234mm tall (~9.2in). I planned to paint mine all along, but you may choose to leave yours unfinished or use different colors of filament. My printing, assembling, and painting process is described completely in the instructions and accompanying GIF animations, so if you want to create one just like the photo, you can! Refer to this GIF album as you read; they'll help you visualize the building and finishing process. I recommend reading the instructions completely before you begin your model. I printed my parts on a MakerFarm Prusa i3v with a .35mm J-head nozzle. My Slic3r settings were .25mm layer height, 50% rectilinear infill, 3 perimeters. I used grey, white, and black PLA filaments. I do not know how the smallest parts will turn out if sliced for a larger nozzle size and/or layer height (doorframe, railing, windows, and deck braces). Keep in mind, a slower print speed may be less convenient, but a smoothly finished tower is worth it. For the railing, I recommend printing two of them together (so you can use the best one) and setting your starting z-height slightly lower than your first layer height to ensure solid plastic connections at the joints. Glue base trim to top of base. Mask off the sides of the hole in the base trim. This is to prevent paint buildup which could cause the octo-connector not to fit. Paint this assembled piece and the doorframe (still separate) with the textured spray paint. Do not use too much paint, or you will cover the details of the bricks and door. Wait for it to dry completely before continuing. Paint the door with brown acrylic paint. Paint the flat wall sections between the decorative corner bricks with brick red acrylic paint. I suggest allowing each section to dry before moving on to the next one. Glue the doorframe in place over the door. It only takes a tiny amount of glue. Keep the octo-connector oriented with the thinner octagon upward, as it was printed, and glue it into the hole in the base trim from below. It will protrude slightly on the other side. Mask off the top section of the tower (above the ring). Paint the exposed lower section of the tower with white spray paint. It is important to let this white base dry 100% before moving on, to end up with a smoothly finished tower. Mask off the lower part of the tower (below the ring). Yes, you are going to paint over the ring that you just painted white (I did it this way to make the masking easier). Paint the exposed top section of the tower with black spray paint. Cut thin strips of tape and mask the stripes onto the tower. Cover any areas that will remain white with tape. Search Google for images of ‘Cape Hatteras Lighthouse’ to reference multiple angles of the actual tower to get your stripes right. This masking job is the most time consuming part of the finishing process, so be patient. Use your fingernail to run along all of the tape edges and ensure it is stuck down all the way. You don’t want the paint to bleed under the tape anywhere. Paint the tower with black spray paint. You must let this dry completely before removing the masking; waiting is no fun, but crisp edges on the stripes are worth it (I ruined them on my first prototype by being impatient here). Slowly and carefully bend the railing into a circular shape, section by section. This is easier when the print is freshly completed and still warm. I removed mine from the bed with a razor blade immediately upon completion and it curled right up. Super glue the ends together, forming a ring. You will have to hold it for a moment while the glue sets up. Put a thin ring of glue in the circular channel on the top of the deck (the area that was face down on the print bed). Yes, the channel was technically an unsupported area, but its only purpose is to show you where to put the glue. Immediately place the railing ring into the channel. Use your fingertips to slightly pinch the ring into a perfect circle before the glue dries. The channel makes this easy to do. Repeat these four steps with the windows and the tower cap. Similarly, the glue goes on the side of the tower cap that was touching the print bed. The only difference is that the cap has individual glue reservoirs rather than a circular channel. The shorter side of the windows section gets attached to the cap (the orientation is clearly visible in this step’s GIF). Put glue into the reservoirs on the bottom of the roof and place it onto the exposed top of the windows. You may want to give your two finished top pieces a light coat of black spray paint to hide the dried glue. Put a small ring of glue around the outer edge of the protruding octo-connector on the base. Don’t use too much or it will ooze out from under the tower. Immediately attach the tower to the base. The side with three windows aligns with the doorway. The octo-connector will just barely be inside the bottom of the tower. It is not structurally important, it’s only there to make aligning the tower easy. Hold the tower firmly in place while the glue sets up. Glue the deck in place around the top of the tower. There is a tiny notch on the underside of the deck which lines up with a corresponding tab on the back of the tower. It will only sit flat when these two are aligned. Glue the cap in place at the very top of the tower. The octagon will fit inside the tower’s top. Orientation does not matter for this piece. One by one, glue the 16 deck braces into the notched ring on the underside of the deck. They will fit snugly against the deck, the side of the tower, and the ring on the tower. Congratulations, your lighthouse is finished! Please share if you decide to make one of your own; I would love to see it!